Firearm owners not only accept responsibility for every round they fire, but also for every round fired from their gun by someone else. Whether you agree with that statement doesn’t matter. Legal precedent demonstrates prosecutors, judges and juries do. Furthermore, firearms are among the most attractive items to burglars and other criminals. Part of being a responsible gun owner is taking reasonable steps to secure them from unauthorized access. Finally, if you have kids in your house … well, do we even need to talk about that? Bottom line: if you own guns, you need a safe. When selecting a gun safe, there are several obvious considerations – the physical size, internal capacity, and its ability to deter theft. However, there are other important characteristics that may not seem so obvious. What exactly do you want to store in your safe? Handguns? Long guns? A combination thereof? What about jewelry and collectibles? 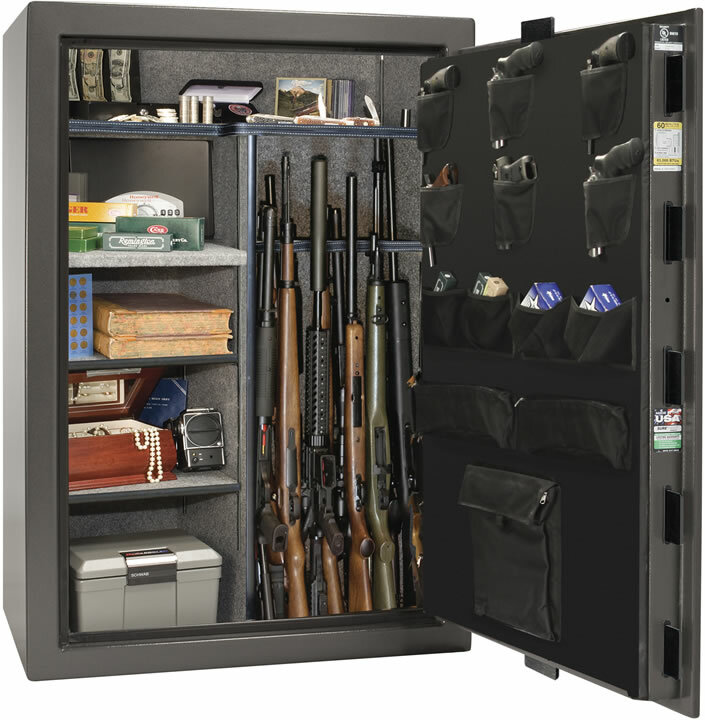 Modern gun safes are available in a wide variety of shapes and sizes to accommodate more than just firearms. Some safes feature configurable dividers, adjustable shelves, pockets, heat-resistant pouches and slide-out drawers. Others provide maximum storage for guns and guns only. Giving careful consideration to the stuff you want to store – and how you’d like to organize it – will help you choose the right safe. Where do you plan to keep the safe? Of course, the location needs to be somewhere that can accommodate its size and weight. However, if you plan to rely upon your firearm for self-defense, the safe also needs to be in a strategic location where it can be opened quickly in an emergency. In a multi-level home it may be physically impossible to rely upon a single firearm and safe for all scenarios. For example, it would make sense to locate a gun in a bedroom safe to protect yourself from a night-time home invasion. However, is that the best location to protect you from a break-in during broad daylight while working two floors down in the basement workshop? Think through all of the potential scenarios; and don’t be surprised to find you’ll need more than one firearm and safe. Also, if you plan to carry a firearm outside your home – particularly in your vehicle – don’t forget to consider how you will securely store that firearm when it’s not on your body. There are many high-quality gun safe options out there that work well for mobile applications. Some are even customized to fit certain popular cars and trucks. All gun safes should be properly mounted to deter criminals from carrying them out of your home or vehicle. Most are equipped with pre-drilled holes and some with specialized hardware for fastening them to the wall or floor. Portable models may come with cables for tethering the safe to an anchor like a seat post or bed frame. Such mounting options won’t necessarily stop determined thieves, but they will slow them down. When choosing a mounting location, looks for studs, joists and other sturdy materials. Keep in mind, you may need to beef up walls and other structures to lag- or through-bolt a safe. Depending upon the contents of your safe, you may be looking for more than a theft deterrent. If you plan to store sensitive documents, protection from fire should also be a consideration. Typically, entry level safes provide little or no fire protection while more expensive models are fire-proof for an hour or more. Some are even rated to protect computer media (CDs, thumb drives, etc.) from fire damage for limited periods of time. Most entry-level gun safes are secured with mechanical key or combination locks. As you move up in price, you’ll find more sophisticated, electronically-assisted locks that require a push-button sequence, encrypted badge, or even a biometric ID like a fingerprint. Electronically-assisted locks theoretically speed up the process of opening a safe and accessing its contents. Our experience is that some of this technology works reliably, and some may not be ready for prime time. Biometric technology can be spotty – it works better for some than others. And the equipment that functions best is usually costly. Most electronic options rely upon batteries for power, so it’s important to keep spares on-hand and test access regularly. In many cases, safes with high-tech locks offer an alternative method of access (usually a key-operated lock) in the event of an electronic failure. Of course, a safe is only as effective as the person who uses it. As responsible gun owners, it’s up to us to know where our firearm is at all times. Bad things happen when we get complacent – really bad things happen when we get complacent with guns. Make a habit of depositing your firearm in your safe when you can’t carry it. Conduct drills on a regular basis to make sure you know how to quickly and quietly open your safe. And know where your backup keys are located. Distribute keys, combinations and other programmable means of access on a need-to-know basis. Purchasing a quality gun safe and practicing responsible storage habits should be considered an indispensable piece of your personal protection plan.